Whether front door or back door, entryways and entrances are important in every home. The front entrance usually receives the most decorating effort in setting the stage for a home. However, in many cases, it is the rear entrance is where most people enter the house. The importance of maintaining a warm and welcoming back door experience should not be underestimated. 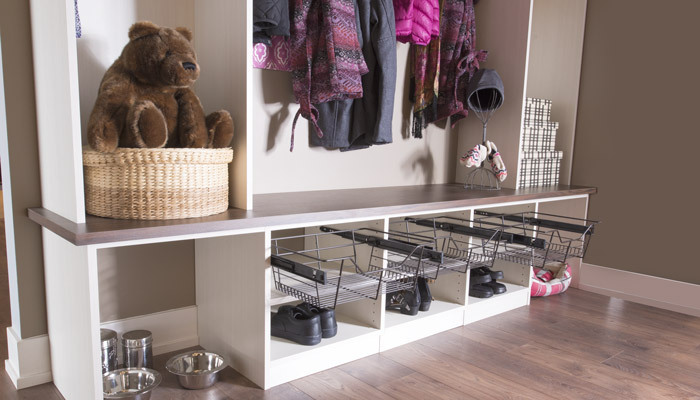 Unfortunately, rear entryways also tend to accumulate a lot of clutter as family members are constantly changing shoes, boots, jackets and other outdoor wear at this location. 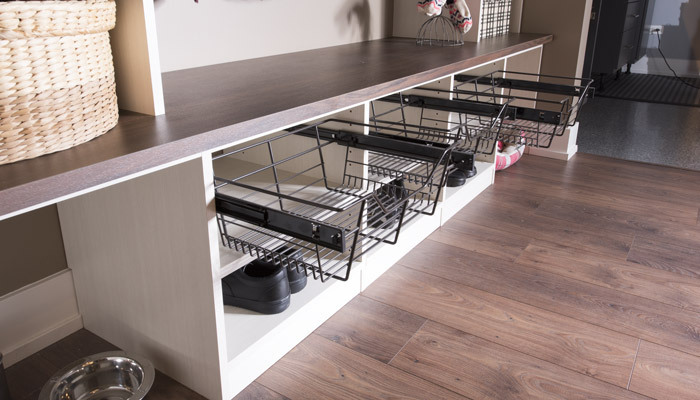 A outstanding solution to creating a clutter free, warm and welcoming experience for friends and neighbors who use the back door is to install a custom mud room organization system. Closet Works specializes in mud rooms ideas to solve any organization problem. In this example, the task of putting things away is greatly simplfied because everything has its own assigned space. Hooks are used for jackets and backpacks — making much more convenient to hang things up, especially for children — thereby increasing the likelyhood that the kids will put their things away. 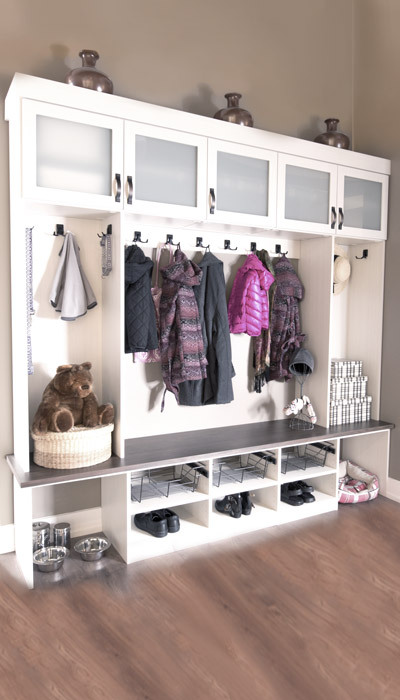 Compartments for outerwear, shoes, storage boxes and more are included under the coat hooks — with a separate pull-out basket for each child to use for their wet mittens and smaller items, decreasing the likelyhood that things will be misplaced or lost in the mad rush to get ready for school each morning. Even the needs of the family dog or cat are considered in the design of this back door organization system. 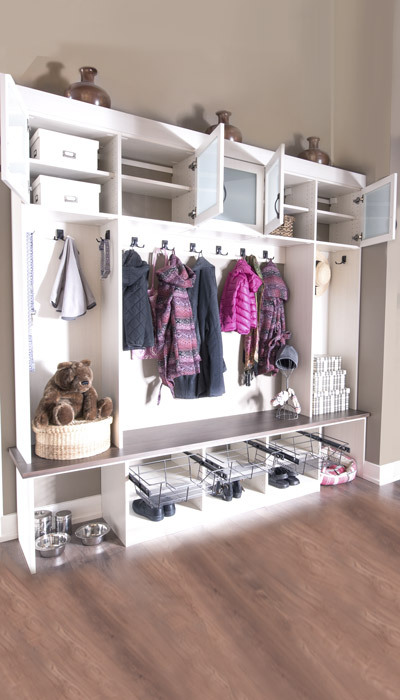 Areas for a pet feeding station as well as a pet bed are desined into the base of the mud room hall tree, ensuring that every family member (even the small furry ones) stay happy and organized. 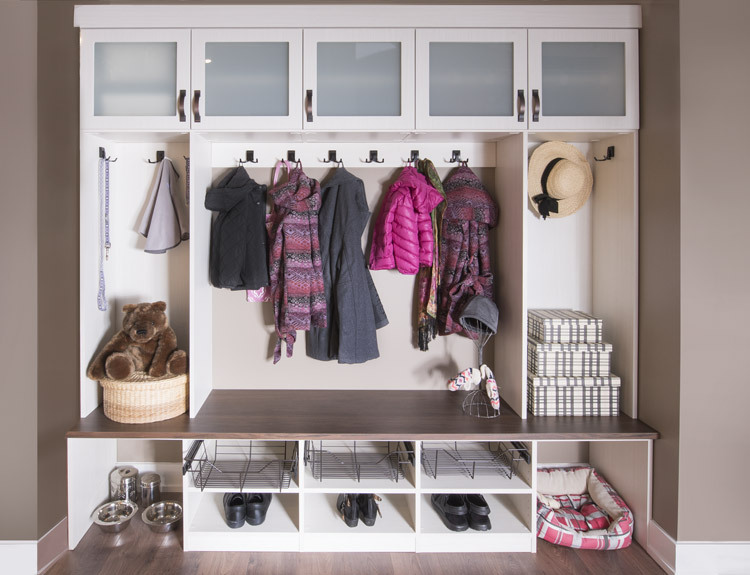 This mud room is an excellent way to maximize the space, leaving the room clutter-free and making an excellent first impression for the owners and their friends as they enter the home.